A look at the economic impact of falling house prices. Readers Question: Explain why a decrease in the price of houses can lead the economy to experience a recession. In summary: falling house prices reduce consumers’ main form of wealth. This tends to cause lower spending and lower economic growth due to a negative wealth effect. Falling house prices tend to have a significant impact in the UK because of the relative importance of the housing market. The sharp fall in house prices from the end of 2007 was a factor in contributing towards the recession of 2008/09. 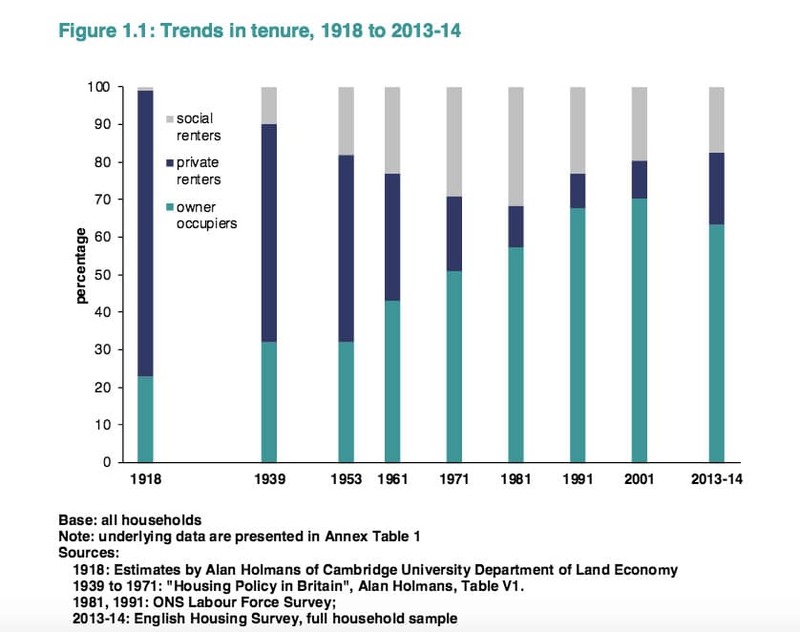 In the early 1990s, UK house prices also fell rapidly due to high-interest rates and the end of the Lawson boom. 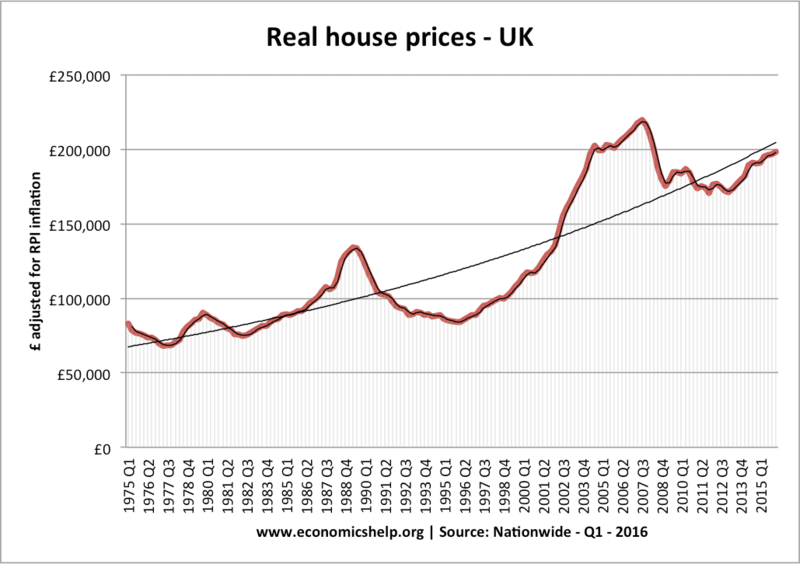 This fall in house prices was also a factor in causing the recession of 1991/92. In both recessions 1991 and 2009, there were other factors apart from falling housing prices. 2008/09 – Rising oil prices, financial crisis, fall in bank lending. Nevertheless, a sharp drop in house prices did affect consumer wealth, confidence and consumers spending. Increased the confidence of householders to spend/borrow and reduce savings. 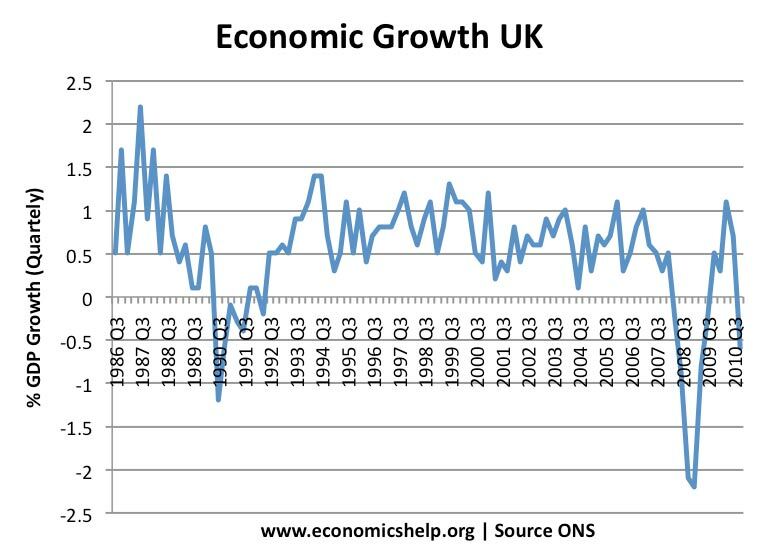 This led to strong growth in consumer spending and was one of the main factors behind UK economic growth. These factors were reversed when the housing market turned. When house prices are falling rapidly, there is a negative wealth effect. Consumers see a fall in their main asset. This decline in wealth causes lower spending and higher saving. Many households become trapped in ‘negative equity’. This occurs when the value of the house is less than the price they paid for it. This awareness of negative equity discourages people from borrowing and encourages them to save. A rise in the saving ratio will cause lower consumer spending. Falling house prices have a significant impact on consumer confidence. It is worth stressing the importance of the housing market to the economy. It is one of the most widely discussed statistics (frequently makes front page headlines) a sharp drop in house prices is often symbolic of an economic downturn. Falling house prices also have an adverse effect on the banking and financial sector. Falling house prices mean banks will lose money if people default from their mortgage payments. These bank losses lead to lower bank lending and lower investment. The scale of bank losses depends on the default rate. In the 2008-09 recession, the rate of bank default was relatively low because interest rates were close to zero. 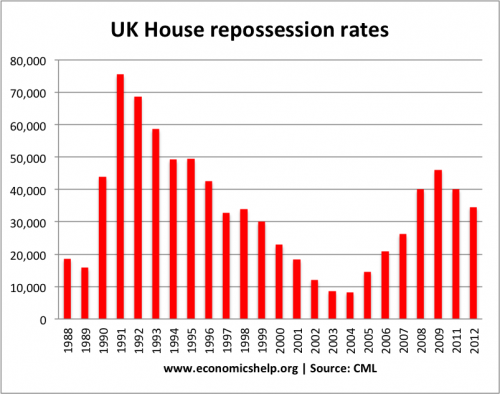 In the 1991-92 recession, falling house prices caused by a bigger repossession rate because interest rates were also very high. One benefit of falling house prices is that it reduces the cost for first-time buyers to buy a house. Falling house prices will help to make buying a house more realistic for first-time buyers. The last decade has seen the ratio of house prices increase much faster than incomes. The effect of this is that many first time buyers struggle to buy. The effect of this is particularly felt in areas like London and the South East. The shortage of affordable housing has caused a shortage of key public sector workers, such as; teachers, nurses and policemen. This is having an adverse effect on local economies. Thus a fall in house prices, or an extended period of flat house prices, would enable the house price to earnings ratio to become better. In theory, a fall in house prices would cause first-time buyers to need a smaller deposit and therefore, it becomes easier to buy. To some extent, with less need to save for a deposit, first-time buyers may be able to spend more on other goods. However, it is worth pointing out, that although falling house prices may increase discretionary income for first-time buyers. First-time buyers are outweighed by the bigger group of consumers who own a house and are more affected by falling prices. Depends on the percentage of home-owners. In 2001, 70% of homes were owner-occupied and therefore consumers would be more affected by falling house prices. But, since 2001, the owner-occupied rate has fallen, meaning a smaller share of consumers would be affected by falling prices. Do falling house prices reduce the cost of renting? 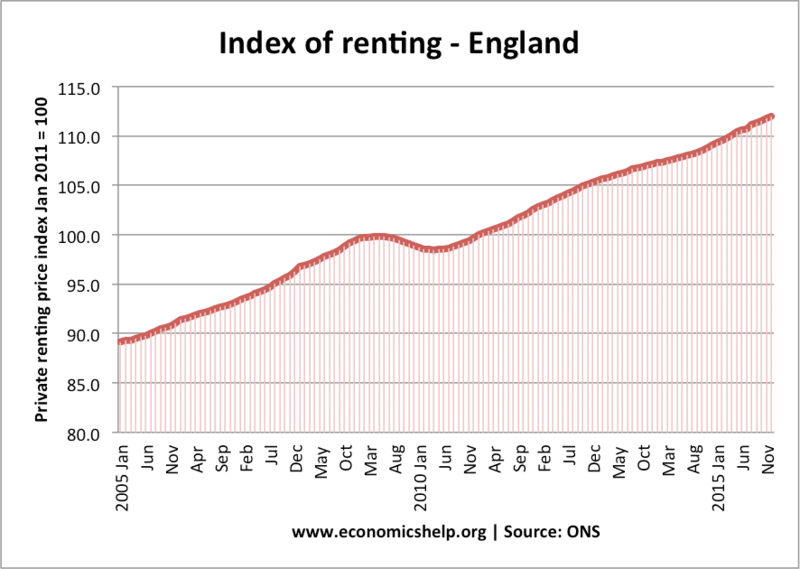 In 2008-10, when UK house prices fell 25% – the real cost of renting fell by 2%. Therefore, there is a weak correlation. But, generally renters don’t benefit from falling house prices. Is this because lenders are unwilling to finance, causing less people being able to buy?? Isn’t negative equity defined as owing more on a property than it is currently worth? Ie, the equity in the property is less than the debt secured against it. 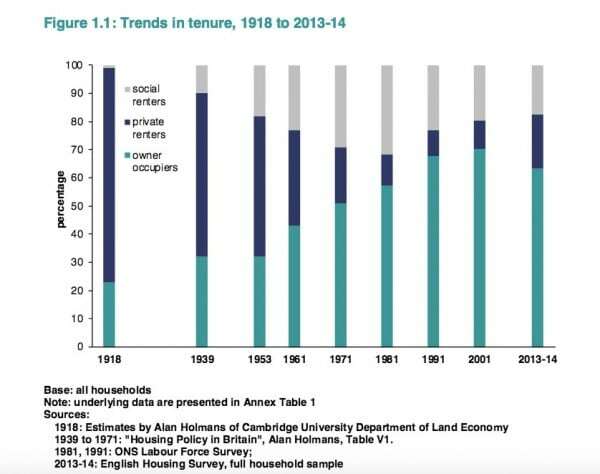 This contributed to the 1991 recession as households were trapped in properties they couldn’t sell, and therefore house building and sales dried up, and people couldn’t move to find new work. As for the 1991 recession being caused by the European Exchange Rate Mechanism, this needs more explanation: Lamont reduced interest rates in 1991 to meet the EC inflation rules, but the the value of the pound was too high. Lamont kept interest rates above 10% to maintain its value, which resulted in short-selling Sterling in September 1992, and Lamont temporarily increasing Bank of England base rates in a vain attempt to maintain the value of the pound while crashing out of the ERM on Black Wednesday. So over-valuing the pound kept interest rates too high for a recession. I’m surprised you didn’t mention the cause of the high interest rates in 1991? 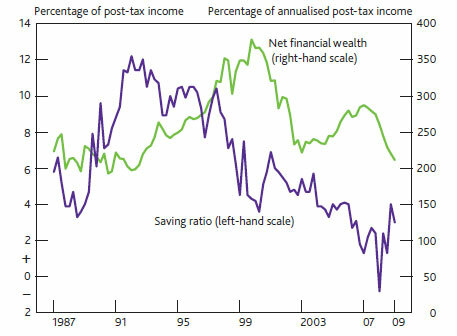 The great income tax cuts by Tory Chancellor Lawson in 1987 reduced the basic income tax rate from 29% to 25%, whereas the higher income tax rate fell from 60% to 40%. This tax give-away to the richest, financed by North Sea oil, together with the selling of Council Houses, resulted in house speculation and an usually rapid increase in house prices between 1987 and 1990 adding 50% to house prices. Then the chancellor increased the Bank of England base rate to curb inflation, increasing mortgage payments, reducing consumer spending, that made house prices fall. Negative equity trapped people in houses they couldn’t afford to sell, making moving for work more difficult. Eventually the stimulus of the tax cut ran out and the increased cost of living was not matched by pay rises, resulting in less consuming spending and a recession.